The GDPR — the EU’s new data protection rules — will apply to some New Zealand organisations, especially those doing internet marketing. 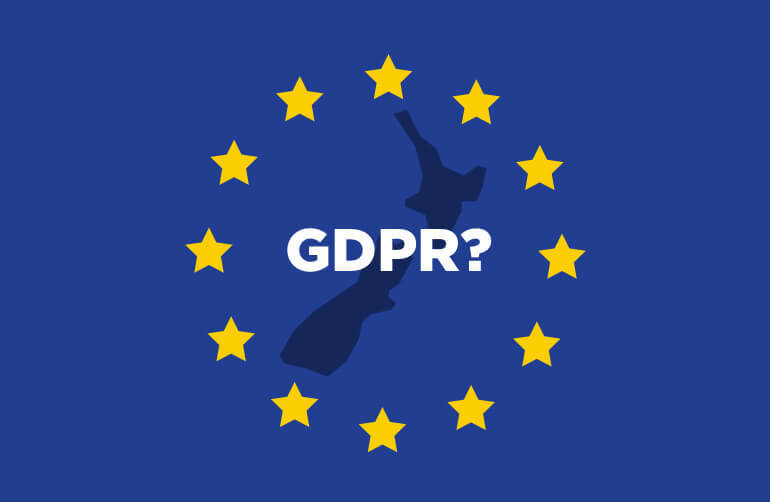 Find out if yours is one of these, what this will mean for you, and learn more about the impact of the GDPR in New Zealand. 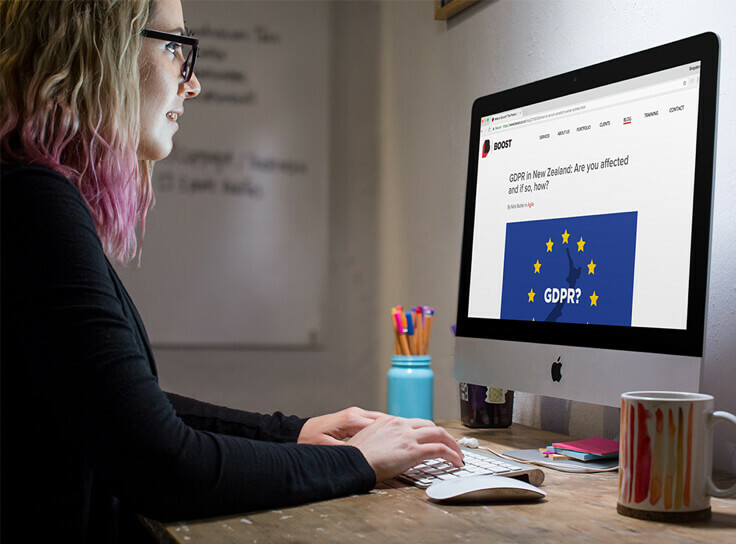 The GDPR came into full effect in May this year and is designed to protect the personal data of all EU citizens. As a result, it may apply to you even if you’re not based in the EU. Imagine for example that you have a New Zealand travel website that specifically targets people from the EU (maybe you offer Italian language tour guides). If you use your travellers’ personal data (perhaps in your email marketing) then the GDPR applies to you. The GDPR doesn’t just apply to businesses either, it also covers nonprofits and government. This post looks at what GDPR means by ‘personal data’, introduces the principles of the GDPR, shows how you can comply and why you might want to, looks at where the GDPR and New Zealand privacy law differ and why they might not do so for long. Disclaimer: Treat this post as background information not legal advice. Everything I know about the law I learnt from watching Boston Legal. Hmmmm, that might need some clarification. If data can be used to identify someone, then it’s personal data. This can include addresses, email addresses, online identifiers such as IP addresses or cookies, photos, and any information that relates to this identifiable person. The GDPR treats information on health, race, sexual orientation, religion and political beliefs as more sensitive than other information. Do I need to comply with GDPR in New Zealand? To find out if yours is one of the organisations affected by the GDPR in New Zealand, the first question is: Do you process personal data? You have a branch in the EU. You offer goods or services, paid or free, to people from the EU (for example, through a website or app) and you explicitly target the people from the EU (for example, by having prices in Euros). You monitor the internet behaviour of people in the EU in order to profile them or predict their personal preferences (for example, by using your data for behavioural-based advertising). Note: the EU includes the UK. They’re still in the EU until Brexit and plan to bring GDPR into UK law once they leave. When the GDPR talks about ‘processing’ personal data, the scope of the term is pretty broad. So collecting the information counts as processing, as does storing, using and deleting it. Also, it doesn’t matter if data is digital or in a physical filing system. The GDPR separates out two roles, ‘controllers’ and ‘processors’. A controller decides the purposes and means of processing personal data. A processor does the work on behalf of a controller. As a controller you need to make sure your contracts with processors comply with the GDPR. As a processor you have specific responsibilities, such as keeping records of your data processing. Sometimes you’ll be both controller and processor. Lawfulness, fairness, and transparency: Collect and use the data lawfully, fairly, honestly and openly. Purpose limitation: Record your specific purposes for collecting the data, and only use it for these purposes. Data minimisation: Only collect data relevant to these purposes. Accuracy of data: Correct, delete or update any inaccurate or out-of-date data. Retention of data: Only keep the data as long as you need it. Integrity and confidentiality: Keep the data secure. 1. You have clear consent. 6. legitimate interests, or the interests of a third party. If you can reasonably achieve the same purpose without the processing, it’s not necessary. You can get more detail from the UK Information Commissioner’s Office’s in-depth guidance. If yours is one of the New Zealand organisations covered by the GDPR, you may want to start planning what you need to do for compliance. Tell people who you are when you request the data. Say why you are processing their data, how long you’ll store it and who receives it. If you collect data from children for social media, check the age limit for parental consent. let the applicant contest the decision. Assess whether the GDPR applies to you. If not, decide whether you want to prepare for possible changes in New Zealand data protection by reviewing your current practices anyway. Map what personal data you collect, how you collect it and what you do with it. Check if you’re collecting sensitive data that requires special treatment. Plan how you’ll comply, now and over time. Learn from what other people are doing (be a fast follower rather than on the bleeding edge). Start the practical business of making any necessary changes to your website, email marketing software, analytics tools and suchlike, along with your personal data processes and records. Many commentators suggest that thanks to the GDPR, New Zealand will have to enhance our privacy protection. That’s partly because, for data to be easily transferred from the EU to New Zealand, we’ll want to maintain our “adequacy status”. This means that the EU considers that our protection is up to their standards. There’s a Privacy Bill in front of Parliament currently and this is likely to take some steps along the way. And it’s possible there’ll be further changes as people see how things shake out with GDPR in New Zealand. The GDPR and the New Zealand Privacy Act are generally aligned, but here are some differences. ask for their data be deleted (sometimes). not a condition for receiving a service. You need reasonable grounds to believe you have consent. Data breaches You must report any data breach that risks affecting the rights and freedoms of individuals. If there’s a high risk you also have to tell the people in question. Reporting data breaches is encouraged but not mandatory (though the new Privacy Bill is likely to require breaches get reported to the NZ Privacy Commissioner). There’s no specific or separate data processor role, so there are no requirements for your contracts with them. Why comply with GDPR in New Zealand? If the GDPR applies to you, and you don’t comply, you could be hit with some fairly steep fines. These can be up to €20 million or 4% of global annual turnover, whichever is larger. But don’t panic, you’re not going to be slapped with a huge fine out of the blue, first up you’d get a warning. it brings a risk-based approach, with the effort needed for compliance tied to how big the risks are in relation to the personal data. Even if you’re not aiming for compliance, it’s worth looking at how you handle your data. There’s definitely something to be said for treating other people’s personal information the way you’d want them to treat yours.